The WIBS (Waveband Integrated Bioaerosol Sensors) are a family of instruments conceived, designed and developed by the Particle Instruments group of CACP at the University of Hertfordshire. They provide a relatively low-cost method of continuously monitoring an environment for biological particles and classifying these into broad categories such as bacteria, fungal spores, pollens, etc. Although originally motivated by military and security concerns over possible deliberate release of organisms, the WIBS' versatility and affordability has also led to a growing international user community in areas of environmental monitoring and occupational health, atmospheric science and climate research, and clean-area monitoring (eg: operating theatres, etc). 'WIBS' technology has been now patented worldwide and in 2012 was licensed for commercial production to Droplet Measurement Technologies Inc., Boulder, Colorado, USA. A WIBS4 bioaerosol sensor (left) and internal opto-electronic and electronics systems (right). Over the past two decades, there has been huge investment, especially in the USA and Europe, in the search for real-time methods of detecting airborne microorganisms, especially pathogens. Of these methods, so-called Laser Induced Fluorescence – the discrimination of biological particles on the basis of their UV-excited fluorescence – has gained the greatest attention. However, solid-state UV lasers, the favoured excitation sources, are prohibitively expensive for use in 'low-cost' detectors and international efforts to produce cheaper UV semiconductor diode lasers of sufficient power have yet to be realised. In 2001, the University of Hertfordshire therefore proposed an alternative approach based not on expensive UV lasers but on cheap xenon flashlamp sources, commonly used in disposable cameras. Under funding from DSTL (the Defence Science and Technology Laboratory) between 2001-9, CACP researchers developed and optimised this approach, which became known as 'WIBS' technology. 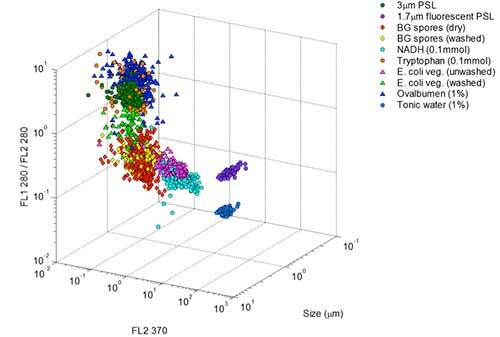 Example of WIBS data classification of various biological and non-biological laboratory aerosols. WIBS deployed in the OPC-3 field campaign in Borneo (2008) to record diurnal bio-aerosol emissions in the tropical environment. Courtesy of University of Manchester. Following a proposal from CACP, a research contract is awarded from DSTL (Defence Science & Technology Laboratory) to investigate the use of xenon sources in UV-excited particle fluorescence. This resulted in the first WIBS prototype that monitored the fluorescence of ensembles of aerosol particles in an ambient environment. A second research contract was awarded from DSTL to develop the WIBS2 - a version with single particle detection capability and enhanced sensitivity. The first WIBS patents filed. A further DSTL research contract awarded to add spatial light scattering capabilities to the WIBS2 to allow particle size and shape to be simultaneously measured with particle fluorescence, thus greatly enhancing particle discrimination. WIBS3, a more compact and robust variant of WIBS2 was developed under further funding from DSTL. Field trials of WIBS against competitive technologies were successful. Further patenting of WIBS technology. A WIB3 instrument commissioned by the University of Manchester's School of Earth, Atmospheric and Environmental Sciences for use in field campaigns in Borneo, USA, and Europe. WIBS technology explored in a joint US-UK technology programme lasting 18 months. WIBS1 core technology licensed to Biral Ltd, Portishead, Bristol, for use in their 'Verotect' military bioaerosol sensor and AFS Standalone Fluorescence Sensor. These instruments continue to be sold worldwide. A WIBS4 commissioned by University College Cork's Dept. of Chemistry for research into atmospheric bioparticles including pollens and fungal spores. A WIBS4 commissioned by the Institute for Meteorology and tropospheric Research, Germany, for studying the role of bioparticles in cloud formation and precipitation. CACP awarded a contract by the Home Office to develop a new real-time bioaerosol sensor - HOBS. 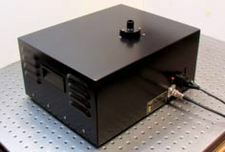 This built on WIBS technology but exploited new developments in spectral fluorescence and spatial light scattering measurement. A WIBS4 commissioned by the Japan Agency for Marine-Earth Science and Technology (JAMSTEC) for use in atmospheric research. WIBS4 instruments commissioned by DSTL and University of Manchester. WIBS technology subject to licensing to two US companies involved in atmospheric science and industrial hygiene respectively.